Tesla just took a major step in Puerto Rico, installing its first solar power system with storage at Hospital del Niño in San Juan. 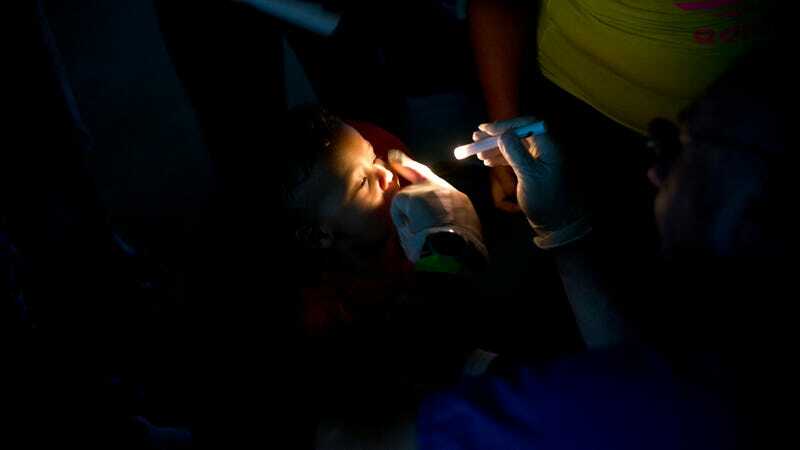 In a country where the power is still out for more than 2.5 million, doctors have performed surgery by cell phone light and the hum of diesel generators is a near constant, the installation is a major success. Tesla promised this would be the “first of many solar+storage projects going live,” though no details on what other projects are on the docket were immediately available. It’s a sign of the company’s growing presence in Puerto Rico as the territory rebuilds its electricity grid that was destroyed 34 days ago by Hurricane Maria. That destruction has given the island, which was already relying on an outdated grid, an opportunity to rethink how it gets electricity with a focus on renewables and a power system more resilient to extreme storms. Hospitals are a logical first place to start the triage given the trouble Puerto Ricans have had accessing healthcare and a burgeoning public health crisis. Elon Musk, the billionaire behind Tesla, slid into Puerto Rico Governor Ricardo Rossello’s DMs following an Earther story in early October. Shortly after those discussions, Musk announced that Tesla would push back production on its electric semi to focus on Puerto Rico relief efforts. The project in Hospital del Niño’s parking lot is the first visible sign of Tesla’s work. The system, which was donated by Tesla, is reportedly able to generate and store up to 500 kilowatts of electricity. The hospital is hanging onto its diesel generators that can kick in when the battery power is exhausted. Getting the lights on and reducing the island’s dependence on diesel is definitely a good thing. Installing renewables that reduce Puerto Rico’s carbon footprint is also a big plus. In doing so, it could also set an example for other islands that are stuck with a similarly crippling reliance on diesel power plants that Puerto Rico had before the storm. Ultimately Tesla is better suited than some of the questionable companies being awarded government contracts. Musk’s investment in working with the Puerto Rican government also seems to be more sincere than the president who has sniped at local officials while taking paper towel jump shots.